Lutherville-Timonium is located in Baltimore County, Maryland. With a population of 15,814 according to the 2000 census, Lutherville-Timonium was later split into two different census-dedicated places called Lutherville and Timonium. Lutherville-Timonium’s summers are warm and humid, and the winters are cold and windy. Throughout the year, the temperature usually ranges from 27°F to 87°F and is rarely below 15°F or above 94°F. Lutherville-Timonium contains the Lutherville Historic District, which is part of the National Register of Historic Places. Additionally, the Maryland State Fair is held annually in Lutherville-Timonium every year near Labor Day. This is an eleven day event full of rides, contests, and many different events. It spans over 100 acres and is continually growing and improving, attracting residents from all over to partake in the festivities. Supreme Air provides Air Conditioning, Heating and Plumbing Services, Repair, Installation, Maintenance, and Tune Up in Lutherville-Timonium, MD and surrounding areas. Yousef is always kind, professional and knowledgeable. Thank you! Yousef was Professional courteous and skilled. Thank you very much for your 5 star review of Yonas. We are very lucky to have Yonas on our team! Have a Supreme day! Replace voltage distribution system. Voltage distribution had a short in the contactor coil. I replaced it and tested the unit for proper operation in cooling mode. Capacitor was surprisingly at full value. Unit cooling with 20+ degree delta temperatures across the evaporator coil. Refrigerant pressures were normal for r22 system. Unit operating normal in cooling mode. Customer declined service membership. I scheduled a free heating check for 10/11/29 at 1pm. Upon arrival I was told that ac in the back wasnâ€™t working. During diagnostics I found thermostat calling for ac but space 79, calling for 72. Setup ladder and went to roof to find York unit had faulted on ignition lockout, not letting ac run. Found flame sensor has exposed portion in the middle, giving false flame sense error. Also found ignition module sending out incorrect voltage. Need to replace ignition module and flame sensor, quoting customer. After resetting system, ac came on so I checked parameters. Unit is operating normal in ac mode with 23 degree delta air temp. Spring pm on 04/01/19 On arrival set units to call for cooling measured supply and return air temp measured voltage and amps inspected electrical connections checked drain and cleaned checked filter and 1 of the unit replaced unit #1 customer donâ€™t have one also checked EWP and LWP recommendation Duct needs to be cleaned also unit #1 air filter needs to be replaced unit tested unit operating normal at this time. On arrival checked thermostat was calling for heat. Checked entering DB 71degre, log DB 115 degree, amps, voltage, electrical connections, filter(clean),contractor, and capacitor. Unit is operating normal at this time. Spring pm on arrival set units to call for cooling measured supply and return air temp measured voltage and amps inspected electrical connections checked drain and cleaned checked filters and replaced checked EWP AND LWP psi is good also I hard when I tested the unit lots of noise coming from loop pump recommended to replace the pump I gave quote for customer accepted I ordered the pump we have to come back to replace the pump units tested units operating normal at this time collected $442 on C.C also customer she need us to send email or text when we receive the parts â€œNO CALLâ€ also she is not in town this week. I found the left side pump was not operating and water flow was low through the unit. I found the wiring issue and fixed it and brought both pumps on and set the pressure drop to 4psi = 12gpm. I also found refrigerant pressures were higher than the printed data and temperature rise was slightly lower than anticipated. I removed 8 oz of refrigerant and this brought the operating pressures within normal range, reduced the amp draw on the compressor to normal range and increased temperature rise to 26-28 degrees. Unit operating normal. I called The service manager to let them know my findings and was told to write it as a no charge call. On arrival found unit not operating due to a defectiv Txv, recovered refrigerant, installed new Txv and a filter drier. pressurized it, vaccum it , and added 5.8lb of 410A. Tested it and unit is operating normal at this time. Per alex. On arrival checked thermostat was calling for heat, inspected indoor unit and found capacitor was not measuring the correct uf. 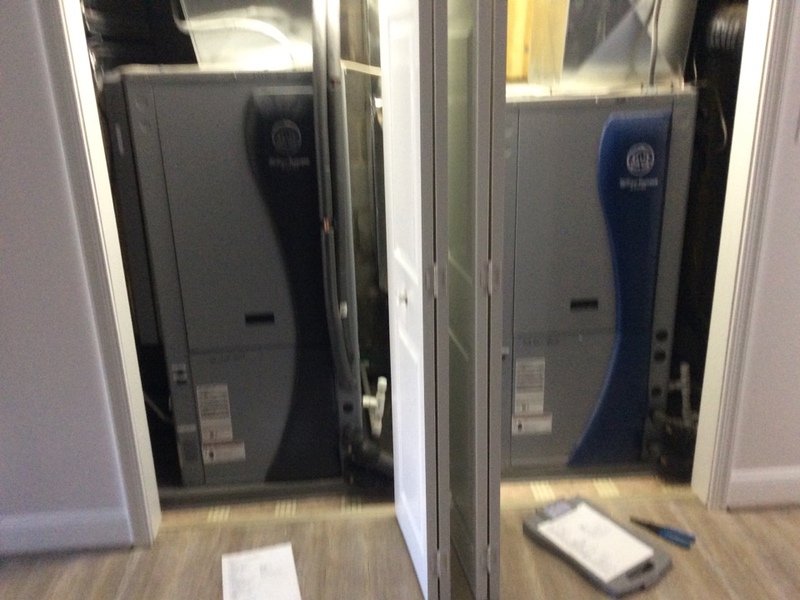 We also inspected unit on the roof, change filters, inspected electrical connections, heat exchanger, and leaks. Indoor and outdoor unit seems to be working correctly. Upon arrival I was told that upstairs bedrooms were cold, especially daughters bedroom. During diagnostics I ran heat on both zones and checked operation. Found normal delta air temps and normal amperages. All dampers opened correctly and space was heating up. Continued to test and found fresh air makeup units are feeding cold air from outside even when makeup air units are off. Spoke to Denny about this because outdoor temp is 60 degrees but return air is dripping at least 5 degrees from space temp when mixing with outdoor air. After speaking with Denny we found that we need to add check valves for both makeup air units (4 valves total) and we need to move the â€œstale air to unitâ€ duct to supply side on both units. Denny informed me he will follow up with customer. Also, customer showed me supply duct that she wanted moved in basement. Customer is installing wine cellar and canâ€™t have duct in space. Took pictures of where customer wants it moved. Office please follow up. Removed faulty thermostat and replace with a Honeywell T4 and checked operations. On arrival found unit locked on low pressure and fp1 33 times .found bad expansion valve.unit is not operating normal.customet refused to pay . Installed new bi- pass humidifier. Started and tested operations . Collect $290 check from costumer . Did not deposit need to hear from office . Found system with a bad defrost board and sensor . Also has a pitted contactor . Made quotes for each and talked over options for costumer . Costumer didnâ€™t approve repair and gave her a sales quote . She was undecided so she was just charged for diagnostic time and trip fee. I operated the unit on heating mode. I confirmed proper flow rate and heat of extraction. I pressurized the ground loop to 65 psi. I checked the electrical wiring and electrical systems, all are within specification, including the auxiliary heat. The filter is okay but more should be ordered. Size = 30*32*2. Unit operating normal. I recommend adding an Apco Air Scrubber to kill germs and viruses and purify the air. I will send an estimate. On arrival found system operating normal,found fresh air on bringing 30 degrees ,advised customer to turn fresh air when it gets cold outside .unit operating normal . On arrival we checked thermostat, we changed two contactors, two canister, and we also added 2 pounds of freon to the unit connected to the master bedroom. Before leaving customer house we checked that all unit were running correctly. Fall pm on 12/21/18 On arrival set unit to call for heat measured supply and return air temp measured voltage and amps inspected electrical connections checked drain and cleaned checked filter unit operating normal at this time. For all residents of Lutherville-Timonium in need of HVAC services, Supreme Air, LLC can help you with all of your different needs! We are prepared to help with any and all HVAC requests, and we are just a phone call away! Our mission is to provide the best service possible to our customers again and again and again. We value consistency in our delivery, and we want every single interaction that we curate to be the same high quality, memorable experience. In order to achieve this, we go above and beyond to prepare for all different varieties of requests. This way, no matter what you need, we can lend a hand and help you out. We value customer service, and we will always greet you with a smile on our face. Throughout the Supreme Air, LLC experience, you should feel free to ask any questions you may have, and we will always give you a friendly and informed answer. We look forward to working with you! Your HVAC systems will rarely wait for a convenient time to stop working, so we make ourselves available 24 hours a day, 7 days a week, and 365 days a year for emergency repairs in Lutherville-Timonium, MD. Your comfort means the world to us, and when you are in need of emergency repairs, we will make time to keep you happy. Our entire business is based on providing the best comfort and safety to our customers, so when there is an issue with this, we will be there to fix it! Our technicians are trained and qualified to perform all sorts of repairs, so you know for certain that when you give us a call, we will be able to help you with your exact situation. We never want you to be waiting for a technician when you need us most, so we prioritize all emergency situations and send our best technicians as soon as possible to support you! While maintenance and tune ups may seem like a boring subject, there is no better way to stay comfortable all year round than having a technician stop by to check on your equipment in Lutherville-Timonium, MD. Our Supreme Air, LLC maintenance visits ensure that your systems are working well, and if they are not, our technicians fix the issues right away. We make sure that there are no broken components or pieces that may be on the verge of breaking. We also examine your energy usage to make sure that everything is running efficiently and not taking up more energy than it is supposed to. If you choose to neglect maintenance and tune ups in Lutherville-Timonium, MD, the results could be disastrous. One of the benefits of maintenance is that qualified professionals identify and fix issues on a regular basis while they are still small. Without this service, these issues will go unnoticed, often manifesting into larger problems that can threaten the wellbeing of your entire HVAC system. The results could be pricey repairs or even pricier replacements, and the solution is simple. Just come to Supreme Air, LLC, and our maintenance packages will keep you comfortable through all four seasons. 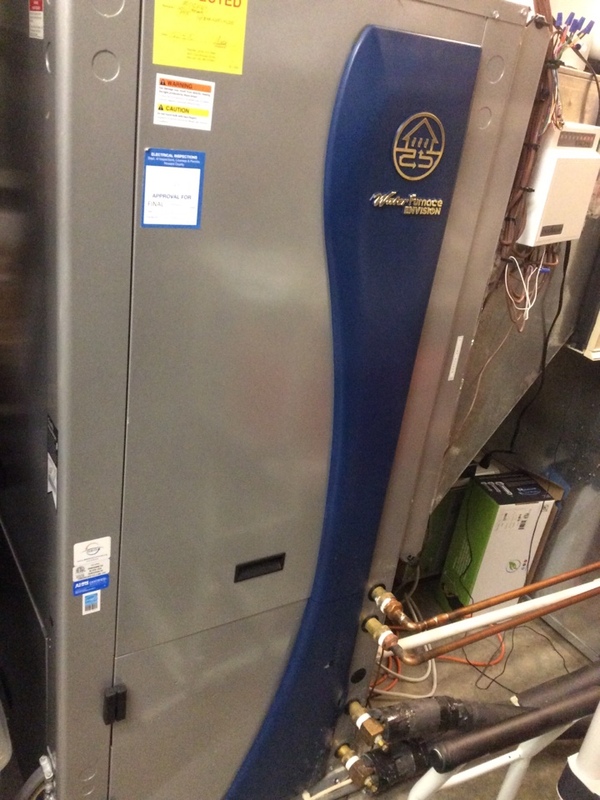 At Supreme Air, LLC, we can help you choose new equipment for installations or replacements in Lutherville-Timonium, MD. We have spent the time to familiarize ourselves with all popular makes and models, and we can walk you through the pros and cons of every one until you have enough information to make a decision you are comfortable with. From there, we also schedule and perform installations, including removal of old equipment if it applies. We will always come to our appointments on time and prepared to work, so you won’t have to wait around for a technician who is late. Many HVAC technicians are infamous for never arriving on time, but we at Supreme Air, LLC in Lutherville-Timonium, MD, are not this kind of company! We care about our customers deeply and respect your time and space. When we perform an installation, we do it efficiently so we don’t take up too much of your time, and we do it neatly so we leave your space as clean and tidy as we found it. The only difference you will notice is a brand new high functioning piece of equipment helping you with your home comfort! Supreme Air, LLC offers all sorts of plumbing services in Lutherville-Timonium, MD because we want your home services to be as convenient as possible. Why go to a different company for plumbing when you can get everything you need right here? Our technicians are experts in their respective fields, and our plumbers are the best in the business. There is comfort in calling one single phone number whenever you need your home serviced, and we appeal to this by offering our services across a variety of different topics. Not only that, but our policies about emergencies cover plumbing as well! The team of plumbers at Supreme Air, LLC is also on call 24/7 for all plumbing emergencies you have in Lutherville-Timonium, MD. We know how urgent plumbing emergencies can be, so if you have any issues with your pipes, give us a call and we will send a plumber to your location to help as soon as possible. When you are dealing with an emergency, there is no solution to consider except for immediate solutions, and we have those just for you! Don’t waste time worrying and stressing about the consequences of your emergency. Instead, call Supreme Air, LLC right away and get your problems fixed now! At Supreme Air, LLC, we believe that everyone should have the opportunity to experience our services because we believe that comfort is a basic human right. Because of this, we will work with you to figure out a financing plan that works best for your current situation. We are flexible and open to different payment plans, and we just want to provide the best experience that we can for the people who do business with us. Give us a call and we can schedule a consultation where one of our team members will talk to you to gauge your current status and offer you a financing plan that we think will fit your needs! In the end, we just want you to have the comforts we know you deserve, so get in touch with us today to figure out how to fund it! Start working with Supreme Air, LLC to get access to the best and brightest technicians and plumbers available. If you’re looking for assistance with heating, cooling and plumbing services, repair, installation, maintenance, and tune-up in Lutherville-Timonium, MD, you’ve come to the right place. By calling (410) 788-1144, you will be getting in touch with the best in the business. We can schedule an appointment, a consultation, or simply talk you through your current options when it comes to your home projects. Don’t wait to get started!